The natural killer (NK), T lymphocyte, B lymphocyte antigen (NTB-A) is a 60-kDa transmembrane glycoprotein of the CD2 family expressed on all human resting and activated NK, T and B cells. This antigen is not expressed on monocytes, neutrophils, and basophils but is expressed on eosinophils. The NTB-A antigen, a 331 amino acid protein, is a member of the immunoglobulin (Ig) superfamily. It is characterized, in its 225 amino acid extracellular domain, by one distal V-type domain without disulfide bond and two proximal C2-type domains, and in its 83 amino acid cytoplasmic domain by three tyrosine residues. One tyrosine residue is part of an ITIM motif and two are parts of an ITSM motif (TxYxxV/I). NTB-A is its own ligand through an homophilic binding. 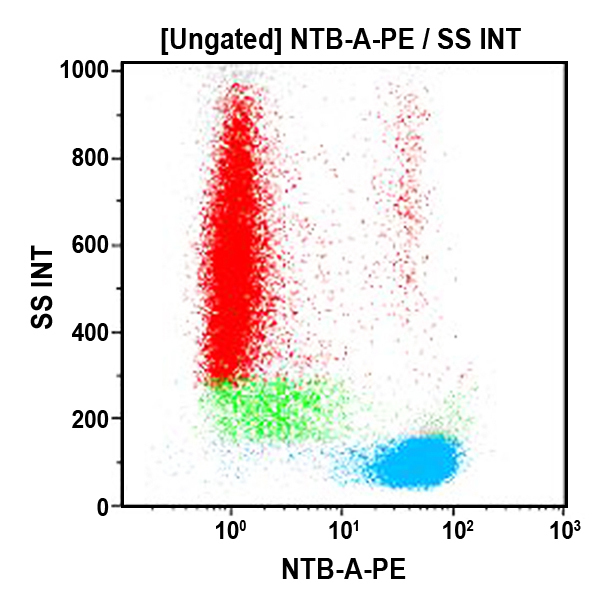 NTB-A associates with two adaptor proteins, the SLAM–associated protein (SAP) also known as SH2D1A and the Ewing’s sarcoma activated transcript (EAT) 2. In NK cells, NTB-A acts as an activating coreceptor.